The subject of minimum wage has always attracted controversy and even attacks from both sides of the political and economic spectrum. I would like to make a few comments on the subject that are long overdue. Firstly all successful markets are managed by the active participants in such a way as to ensure general cooperation. Breakdowns do occur but are normally short lived and a new level is quickly adjusted to. Because the supply and demand is bundled into finite units, no single transaction is part of continuity, but the aggregate of such transactions can be smoothed to look continuous. The labor market is no different. It is just not very efficient in transferring services. To this end, governments have chosen several market intervention options. The main one is the setting of a minimum wage to halt a race to the bottom and effective slavery. In concert we also have welfare and unemployment benefits to backstop part of this market. All this has been somewhat flawed and not very efficient. What I am about to propose is part of a general proposed reshaping of our economic system and must naturally be somewhat out of context. In short, there is a lot more than what I am now describing. 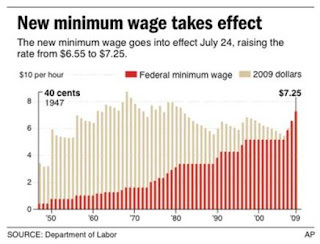 Minimum wage must be properly backstopped and operated as part of the labor system in such a way as to encourage the full range of market forces to be applied both now and over time. By this I mean that the minimum wage also comes with a job attached. The trick is to have employers bid for the available labor. Thus we have an employer bid for say ten employees at say $6.00 per hour when the minimum wage is say $10.00. The employer pays out the wage at $10.00 and receives a rebate for $4.00. This process allows the labor to be available and planned for in circumstances that must have a low cost base in order to work. You can see that everyone gets the maximum benefit from a healthy trading market and that cost of labor becomes a useful speculation to the employer who might never make the investment on the original basis. Obviously unemployment ends. Also when folks are between major jobs they are automatically available to work at convenient min wage jobs that need to be done. It will take time for our economy to adjust but it in the long term a lot of projects dependent on low wages can be put in place to operate when labor supply is there. This will pull the slack out of the economy and provide a healthy work environment for all because it will be simply taken for granted that when a person is laid of that he immediately is available for min wage work. It is no trick to step away from a high skill level job to a min wage job on a temporary basis if it is socially accepted. I am also saying that it is easy to organize one hundred percent employment by doing this. Recall that is where we came from when all were part of a village. It is also a huge benefit for employers who can organize labor intense projects that commence only on availability of labor at a low enough cost. Of course, everyone will scream about cost, but that is answered positively, but with a lot of reshaping of your thinking. We will not do that today.